3. URL of spoof website disguised as " http://cgi3.eBay.com/aw-cgi/eBayISAPI.dll?SecureConfirmation&bpuser=1 ". 4. Real URL a bit like eBay - do not be fooled! 5. Website traced to Bismarck, USA .
" 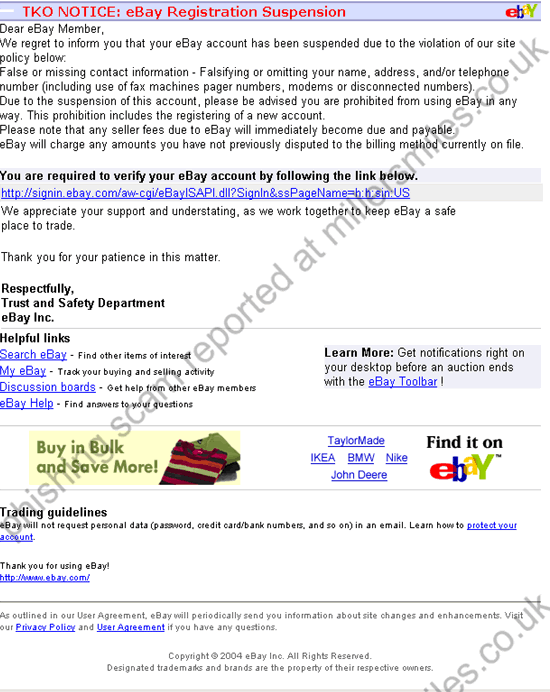 We regret to inform you that your eBay account will be suspended due to the violation of our site policy below: "
Spoof website not online at time of report - may have been disabled or may be reactivated.